Student-athletes: Please take the time to consider attending this free screening program at Hurley Medical Center’s School of Nursing on Saturday. As many of you know, a Swartz Creek High School basketball player nearly lost his life last week after collapsing in an open gym. He was fortunate to have fast-acting coaches who knew exactly what to do in the gym. Far too often that is not the case. Please take this seriously. The screening program was developed by Beaumont Hospital for students involved in vigorous activities and organized sports. Our Hurley Teen Health Check Student Heart Screening Program combines a simple health history and noninvasive screening to look for signs of hypertrophic cardiomyopathy (HCM). This is a serious heart condition that is the leading cause of sudden cardiac death in young athletes. HCM affects approximately one in 500 people, and does not usually have any symptoms. The stress on the heart during strenuous activities puts our students at higher risk for sudden death. Hurley Medical Center is offering this screening FREE OF CHARGE to mid-Michigan students on Saturday, November 5, 2011 from 9:00am to 3:00pm. The event will be held at Hurley Medical Center, School of Nursing. You must pre-register to participate. PLEASE SHARE THIS INFORMATION WITH YOUR SCHOOLS, FRIENDS, NEIGHBORS and CHURCH MEMBERS. Students will undergo a quick screening that will include a review of the health history questionnaire that you will need to complete at home. They will have their blood pressure checked and an electrocardiogram (ECG) will be performed. A cardiologist will evaluate each student. The doctor will listen to the student’s heart and may choose to take a quick echocardiogram, a noninvasive picture of the heart. To participate in the Hurley Teen Health Check Heart Screening Program you will need to complete the attached paperwork (see link) and return it with your child on the day of the screening. If forms are missing or incomplete, we will be unable to screen your child. The data we collect may be used by researchers at Hurley Medical Center and Beaumont Hospital to add to the scientific knowledge of sudden cardiac arrest in young athletes. The data will be reported anonymously. Student privacy and confidentiality will be maintained. PRE-Registration for the screening is required. To register, please call 810-262-9260 and press option #1. 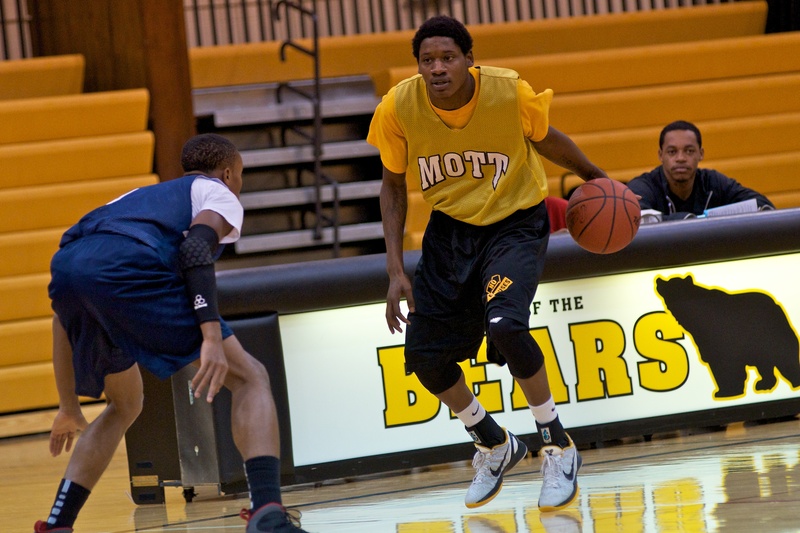 Mott sophomore John Taylor, a 6-1 guard transfer from Chicago, is a high-major talent who will rank among the top JUCO guard prospects in the country. can compete with anyone in this league. The Lakers are fresh off a strong performance at a preseason jamboree at Vincennes. Mott, the odds-on favorite every year to win the league, has a roster brimming with talent from across the country. Coming off a 33-3 season season in which the Bears finished second nationally, Steve Schmidt has a stable of young guards that you have to see to believe. The group is headlined by sophomore transfer John Taylor. I didn’t believe the early returns on the 6-1 guard from Chicago until I saw him with my own eyes. I was told that he had more talent than Mott’s last Chicago-bred All-American (Jeremie Simmons, Ohio State), and I simply could not believe it. (For Mott fans, it’s basically sacrilege.) Well, he does. Clearly there is more to evaluating a player than just talent. I’m not going to be so presumptive as to say he’s a better basketball player than Jeremie Simmons, who was the national player of the year as a sophomore, but his talent is immense. Taylor’s first five 3-point attempts didn’t even hit the rim. His lefty stroke is just as pure coming off screens as it is off the dribble. He actually bears a striking resemblance to former Mott guard Sam Burton (who also wore #2). Burton got after it on the defensive end and could attack the basket with the best of them. Taylor, however, has significantly more ammo in his offensive arsenal. I just don’t know how anyone will be able to guard him man-to-man. Another potential stud on the roster is also a 6-1 guard. Ralph Eason came to Mott by way of Huntsville, Alabama. He’s a player in the mold of former Mott guard TJ Cameron, but he’s much more explosive to the rim. 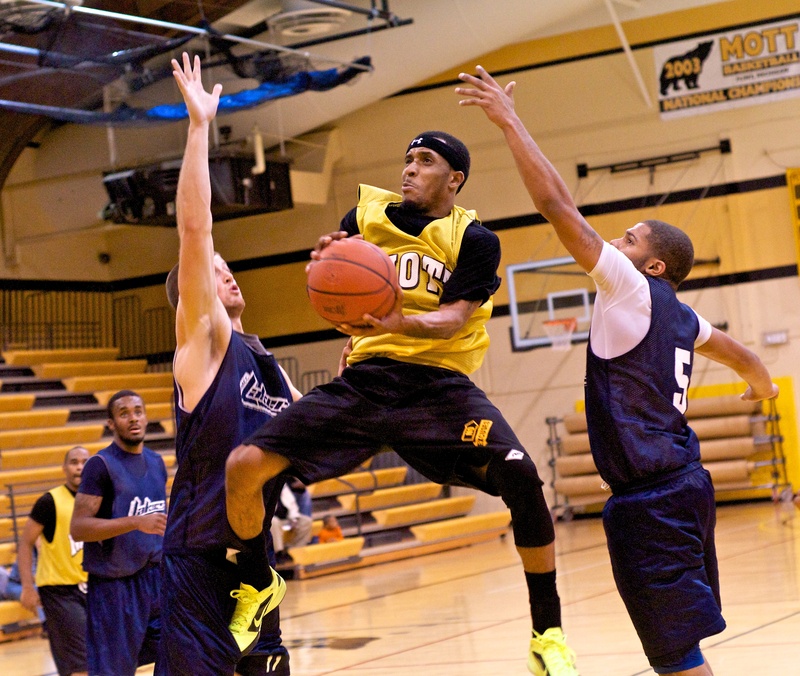 The bright spot for Mott, in my opinion, was former Flint Northern standout Shaquille Smith. The 5-9 guard proved worthy of significant playing time this season. He’s really crafty with the ball, uber-quick and still capable of hitting those quick-stop pull-ups he made throughout his high school career. Mott will lean heavily on two strong forwards in the 6-foot-5 range to hold down the paint this season — Chavis Mattison (Anderson, SC) and Eugene Gipson (Humble, TX). I would not, however, be surprised to see the Bears go with four guards for many of their offensive sets. One of the Flint area’s most underrated prospects has verbally committed to Michigan Tech, a D-II university in the Upper Peninsula. Stoll, a 6-7 senior at Holly, will be among the top players in the Flint area this season. He has tremendous upside as a scorer and defender, and he hasn’t even scratched the surface of his ability. Stoll has a motor that just doesn’t quit and is, pound for pound, among the toughest players in the 2012 class. If he continues to develop his perimeter skills (he’s already a pretty reliable outside shooter), he could see some time as a small forward in the future. I think Stoll, who is actually young for his grade, is better at this point in his career than Nathan Cox (formerly of Flushing), who went on to become an NAIA All-American at Davenport University. CITYBEAT: Is It OK to skip 2012 class? Somewhere near Flint— After the departure of the Flint-area’s most promising class of 2012 basketball prospects, frankly I question whether it is even worthwhile to discuss the upcoming year in great detail. In fact, a D-1 college head coach that I spoke to recently said, “If you’re going to lose scholarships, this is the year to do it because the 2012 class is weak, but the 2013 class is loaded.” So, with that said, I am asking today if it is ok just to skip that year entirely. Ok, so I know that is not possible, but for the purposes of this column the answer is yes. Anton Wilson (Macdonald Academy, NC) – Some of you still don’t know, so today I will let you in on a secret. You ready? Anton has found a way to travel back in time! How did he do it? Prep school of course! Transferring from Carman Ainsworth to Northwestern (briefly) and then to MacDonald Academy has allowed him to re-classify himself from the 2012 class to the 2013 one. Having already been receiving offers from D-1 programs, this will only serve to help him, as he will have a whole extra year to develop his game and his strength. A prep school schedule and exposure will aid him as well. I am going to still count him as Flint-area because that’s where he was groomed. He is the best wing prospect of the group right now. Two of the state’s best prospects in the 2013 class are on unofficial visits this weekend. Flint Beecher’s Monte Morris, a 6-1 high-major point guard prospect, is taking a visit to Arizona State in the PAC 12. Swartz Creek’s J.D. Tisdale, a 6-5 combo guard, is an under-the-radar D-1 guard prospect. He is visiting Central Michigan University in the MAC. Morris has been on the D-1 radar since he was a freshman at Beecher. Tisdale has only recently been thrust into the D-1 spotlight with tremendous performances at tournaments and camps in summer and fall. Several schools have shown interest in Tisdale including CMU, Toledo, BGSU, Oakland and Wichita State. In the Flint area, the 2013 class is loaded with talent with Morris, Tisdale, Denzel Watts (Flint C-A), Richie Lewis (Flint Northern) Bart Williams (Grand Blanc) and Lapeer West’s dynamic duo of Zeshawn Jones-Parker and Cullen Turcyzn.